Match 7 $15,000,000 0It's a Rollover! A woman has stepped forward to claim $2 million from the Powerball lottery draw on Wednesday 18 September. Angeles Jones of Rockledge, Florida, matched the five main winning numbers 7, 10, 22, 32 and 35, while choosing to wager on the Power Play option to double her initial $1 million win. The fifty-five-year-old purchased her ticket from a local Rogerâ€™s Discount Beverage store, and her win also means a $5,000 commission bonus for the delighted retailer. The Roger’s Discount Beverage store where Angeles bought her $2 million-winning ticket. Angeles was just a Powerball number away from winning the $399.4 million jackpot, the fourth highest in Powerball history, which instead went to a man from Columbia, South Carolina, who chose not to be named. LotteryWorld readers will know of his lucky story â€“ he was asked by his wife to pick up hotdog buns and visited a Murphy Express gas station in nearby Lexington. The store didnâ€™t stock the bread so he bought $20 dollarsâ€™ worth of lottery tickets instead, and the rest, as they say, is history. Two other players join Angeles in the $2 million winnerâ€™s club from the September 18 Powerball draw by also matching five numbers and wagering on Power Play. One of these winners also hails from the Sunshine State and was sold in Pembroke Pines, while the other was bought in Cumberland County, Pennsylvania, although lottery officials say both these winners have yet to come forward. LotteryWorld urge all players to keep your ticket safe and, if you havenâ€™t done so already, check your numbers as soon as possible as these Powerball prizes will expire after a year if theyâ€™re not claimed. Florida enjoys some of the highest lottery sales by state across the US, and this is evident in the number of big winners. In May, Gloria McKenzie snared $590.5 million which is the largest ever US jackpot won to date by a single ticket. With this Saturdayâ€™s double-rollover Powerball worth an estimated $60 million, non-Sunshine State residents will be hoping that Florida shares some of that precious lottery luck around the country! Lottery players will also know that the Mega Millions has an estimated top prize of $173 million up for grabs, following seventeen consecutive draws without a jackpot winner. For more news and information on the Powerball head on over to Powerball.net. Winning the lottery is something millions of people across the world dream of on a daily basis. However, dreams can quickly turn into nightmares and sometimes the reality of becoming a millionaire overnight can prove hard for people to deal with. One of the recent winners of the $448 million Powerball jackpots, Willie Seeley, is finding this out the hard way. Readers may remember Willie as being the stand out character of the Oceans 16 syndicate who shared one third of the $448 million Powerball jackpot back in August. With his straggly beard, tinted sunglasses and lively on stage antics, Willie was immediately adored by the public, especially when he announced during the press conference that he would be using some of the money to pay for his fatherâ€™s cancer treatment. He even appeared on the Today show a day after claiming his check for $3.8 million, talking about how the money wouldnâ€™t change him. Willie and Donna Seeley appearing on the ‘Todayâ€™ show. Image from NBC News Today. Sadly however, things havenâ€™t gone so well for Willie since his win. He and his wife, Donna, recently gave an interview with NBC News in which they admitted they were missing the simplicity of their old life. As well as being harassed by distant relatives and strangers for cash, the family has also been hounded by every reality TV company in America who all want to make a star out of Willie. Willie however, wants no such thing. 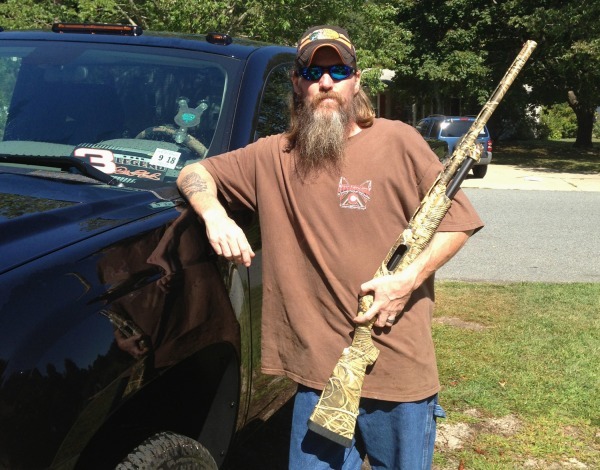 In the interview, less than a week after he was photographed posing with his brand new truck, Willie explained the pitfalls of his newfound money and fame. â€œWould you want a camera following you around all day when you finally have the time to go hunting and fishing and do all the things you wanted to do?â€ His wife agrees, going as far as to call the money â€œa curseâ€. Willie has said he plans to escape the circus around him by moving to his newly purchased cabin in the woods which stands in 15 acres of land, where he and his family can â€œbe themselvesâ€. While we at LotteryWorld feel for lottery winners who struggle to cope with the demands of their sudden new fortunes, it cannot be denied that Willie has courted the media since his syndicate went public over a month ago. A stream of photo opportunities, TV interviews and press articles has kept Willie and his family in the public eye and this hasnâ€™t helped his quest for normality. Although New Jersey is a state which requires players to go public, winners deal with this in a variety of ways. While they must give their names, they are under no obligation to give press conferences, TV interviews or make any other media appearances. Other members of the Oceans 16 syndicate have chosen to stay quiet, making no media appearances and giving no quotes. We have to wonder if they are receiving the same level of attention from long lost friends, family and TV producers as Willie. As for Willieâ€™s advice to the South Carolina winner? Luckily for him, he lives in one of the six states which allows players to retain their anonymity. So, providing he keeps a low profile instead of following in Willieâ€™s footsteps, it could be that his identity remains under wraps forever.